Siebens Building, Subway Level, Mayo Clinic, Rochester, Minn. Call 507-284-8140. Patients can receive materials free of charge by providing their Mayo Clinic Registration Number. Become an effective partner in your health care by using the resources of the Barbara Woodward Lips Patient Education Center. 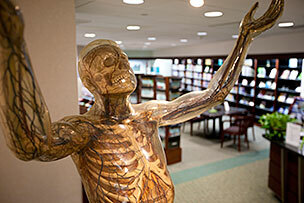 The center has a library with patient-friendly informational materials as well as models, exhibits and classes taught by patient education specialists. The center is named for Barbara Woodward Lips, a resident of San Antonio, Texas. Mrs. Lips had a lifelong love of learning, the desire to empower others and a respect for high-quality care at Mayo Clinic. Copyright © 2001-2019 Mayo Foundation for Medical Education and Research. All Rights Reserved.